PS3 Wand to finally break cover in LA in June? E3 fever is sweeping the gaming world faster than swine flu in a Mexican piggery, with those all-too-predictable rumours flying around of an imminent 'next Xbox/ Xbox 720' from Microsoft, a high def Wii from Nintendo and (in addition to a UMD-free PSP) the final reveal of PS3's motion-sensing controller from Sony, among many others. 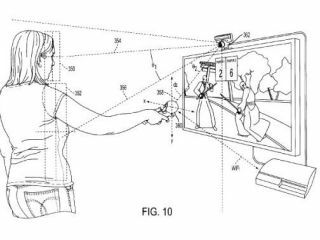 The motion-sensing controller – the PS3 Wand (you can see a pic from Sony's original patent here) – is the latest rumour to take hold across major gaming sites, with news emerging from Variety. If true, it looks like the PlayStation 3's motion-controller will finally be wheeled on stage when Kaz Hirai and his team present (or, rather, perform!) this year's E3 media conference gig. "A good source saw a working prototype several months ago that largely fits what was in the patent," reports Variety. The report continues: "Sony's controller apparently used LEDs and a small webcam to track the device's movements. Because the camera can read different color lights and the shape and angle of each light, it's much more accurate than the Wii-mote. "It can track precise movements, including along the Z axis (pushing toward and away from the TV(something the Wii is really bad at) as well as velocity." Kombo.com reported earlier this year that Sony is working with selected developers on motion-sensing games. If both the PSP Go! and the PS3 Wand rumours turn out to be true, then Sony looks set to give an electrifying E3 performance in June. Something the company desperately needs to instill confidence amongst gamers and industry pundits alike.